habitation on the islands in these periods. 1816 Vietnamese flag planted in a formal ceremony on the Paracels. 1885 China restates its claim to the islands. 17 Oct 1887 Claimed by France as part of French Indochina (see Vietnam). 1932 China protests French sovereignty over the islands. 13 Jul 1938 - Aug 1945 Japanese occupation. 23 Apr 1939 Japan declares sovereignty over the Paracel Islands. 1941 Annexed by Japan, part of Taiwan province. 7 Jul 1951 Claimed by South Vietnam. 8 Sep 1951 Japan officially renounces sovereignty by Treaty of San Francisco. 22 Oct 1956 Formally annexed by South Vietnam, part of Phuoc Tuy province. 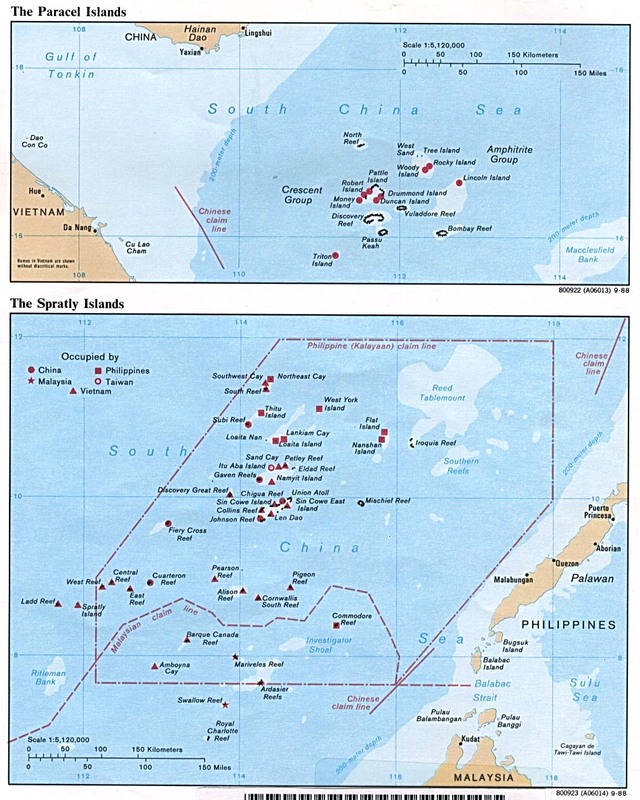 (Spratly) Islands are historically Chinese territories. 13 Jul 1961 Placed under Quang Nam province by South Vietnam. 2 Jul 1976 Claimed by Vietnam (Hoang Sa). Territorial Disputes: Occupied by China, but claimed by Taiwan and Vietnam. 1211 Island group is first shown on a Chinese map. 1405 Visited by China (Nansha Qundao [Southern Islands]). 1530 Sighted by Portuguese explorer Alvarez de Diegoz. 1606 Claimed by Spain as part of the Philippines . 1791 Visited by British Capt. Henry Spratly discovers Mischief Reef. builds a temple on North East Cay. 1798 British navy builds an iron observation tower on Itu Aba. 1802 Claimed by Vietnam (Truong Sa [Long Islands]). Spratly Island and Ladd Reef. to have establish a kingdom on the islands. 1885 China restates its claim to the Southern Islands. 1887 Claimed by France as part of French Indochina (see Vietnam). 1893/97 Britain declares a protectorate over the islands. 10 Dec 1898 Specifically excluded from Philippine territory by Treaty of Paris. 10 Apr 1930 France occupies Itu Aba Island and Amboyna Cay. Thien province by the Governor-general of French Indo-China . and dependencies- by Governor-general of French Indo-China. 4 Apr 1939 Japan declares the Spratly Islands a protectorate. 12 Dec 1939 - Aug 1945 Occupied by Japan. part of Taiwan province; Japan builds submarine base on Itu Aba. Oct 1946 Claimed by China, part of Guangdong province. the new state of Kalayaan (Freedom Land). Islands are historically Chinese territories. 8 Jun 1956 Taiwan takes Itu Aba (Taiping) island from Philippines. 1969 - 1971 U.S. radar station on Spratly Island. 1 Jul 1976 Claimed by Vietnam (Truong Sa), part of Khanh Hoa province. Guangdong province (from 13 Apr 1988, Hainan province). 11 Jun 1978 Philippines officially annexes the islands. Island features as part of Sabah state. and Amboyna Cay as part of Sabah state. by Philippine forces on 20-28 Mar 1995. China currently occupies 7 areas (Cuarteron, Fiery Cross, Gaven, Hughes, Johnson, Mischief, and Subi); Taiwan occupies one (Itu Aba); and Vietnam occupies 21 areas (Alison, Amboyan, Barque Canada, Central London, Cornwallis South, East London, Da Gri-san, Da Hi Gen, Great Discovery, Ladd, Landsdowne, Pearson, Petley, Sand, Sin Cowe, South Reef, South West Cay, Spratly, Tennent, and West London); parts of them are claimed by Malaysia (which occupies 3- Ardasier, Mariveles and Swallow Reefs); and the Philippines (which occupies 8 areas- Loaita, Nanshan, West York, Lamkian Cay, Thitu, North East Cay, Flat, and Commodore Reef); in 1984, Brunei established an exclusive fishing zone that encompasses Louisa Reef in the southern Spratly Islands but has not publicly claimed the island; claimants in Nov 2002 signed the "Declaration on the Conduct of Parties in the South China Sea", a mechanism to ease tension but which fell short of a legally binding "code of conduct"; in Mar 2005, the national oil companies of China, the Philippines, and Vietnam signed a joint accord to conduct marine seismic activities in the Spratly Islands.